Whilst I didn’t ever think our lives would have been hit by DDH, and as hard as some days can be, one of the positives has been making some lovely friends. I have been in touch with Sam Bowen for the past few years and shared many emails and experiences and her daughter, Lucy, is featured in Cast Life. We are eventually going to meet in April when I am her ‘plus one’ at a lunch with the charity, Lord’s Taverners where Sam will give a speech as they were the grant givers for a sensory room at Lucy’s special school and Sam was one of the fundraisers. 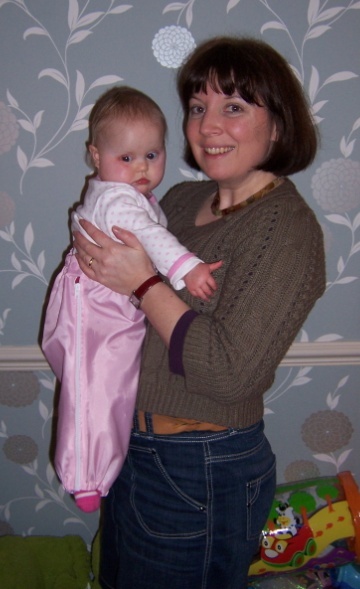 Sam works tirelessly not only to look after Lucy who has severe disabilities and medical issues including DDH, but she has also developed a range of fantastic clothes for children in casts and harnesses – something that makes jeans and pjs pretty hard to get on your child. 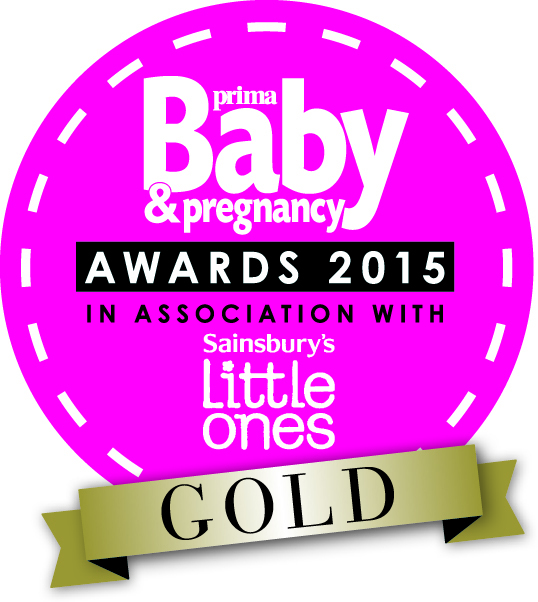 I am delighted that recently Sam’s business, Hip-Pose, has won the Prima Baby Award for innovation for the second time. Today she is talking about the changes DDH has created in their lives and how her business has grown and where she is taking it next. I never dreamed five and a half years ago that the little waterproof trousers I had made to cover my daughter’s hip spica cast, would spark a business idea, . Nor that four years on it would become an award-winning international success. Yet here I am having just received a Prima Baby Award for innovation for the second year running, up against household names like Mamas and Papas, Tommee Tippee and John Lewis. My little hip spica trousers won Bronze this year and the sleepsuit I designed for Pavlik Harness won Gold last year. I still have to pinch myself to check I’m not dreaming! This all started when my daughter was diagnosed with hip dysplasia (DDH) at six weeks old and put into a Pavlik harness, she was tiny weighing in at just 6lbs and looked like a broken little bird. My heart broke with it, but not just at the DDH diagnosis. That same week, with unbelievable timing, we had learnt that our only baby also had a rare genetic condition that would cause her severe disabilities and medical issues. My world as I knew it ended that week. Numb with fear over what lay in wait in the future, we focused on the DDH as a treatable ‘fixable’ condition and even when Lucy needed to go on to have open reduction surgery on her hip, we felt like it was running it’s course and would be ok in the end, which thankfully it was. The frustration over clothes however was something I couldn’t bear, not only as we were told the cast could not get wet (it was winter!) but also because the stares we got from complete strangers added to my already growing paranoia over how people would treat my daughter. So ever the practical person, I bought some pale pink waterproof fabric and an open-ended chunky zip, designed a pattern to fit her in cast and made the trousers. I noticed straight away that strangers didn’t look twice when she wore them as they seemed to hide the cast, so I went on to make them in denim, cord and cotton purely to have fun dressing her and add a bit more ‘normality’ into our lives. The staff treating Lucy’s DDH loved the trousers and were very encouraging. It was Lucy’s surgeon, a wonderful man, who suggested I make them to sell to other people and sowed the seeds of a business idea in my mind. This coincided with my having to give up my much-loved career in Museums to become Lucy’s carer, which is quite a different thing to being a parent. The barrage of medical appointments, therapy and then more operations including open heart surgery really couldn’t tie in with holding down a 9-5 job. In those darkest moments though, sat at her hospital bedside at 2am, it’s been the wonderful emails I’ve had from happy customers who tell me how my DDH clothes have helped them to cope through what I remember as a difficult time. People are so genuinely grateful that someone cared enough to make the range and I’m humbled by that. So yes the awards are a great achievement and confidence boost, but it’s the parents, grandparents and brave hip kids that are my inspiration and the reason why I continue to expand the range. This year I hope to export on a larger more organised scale and also supply more NHS hospitals with sleepsuits and trousers to give at diagnosis and after surgery, because it may be five and half years ago, but I remember like it was yesterday what it felt like to not be able to dress your child leaving hospital. For more information please visit www.hip-pose.co.uk and well done Sam, you are amazing.